Lupton a tiny village on the Arizona - New Mexico state line. Famous for its Painted Cliffs, which appeared in the movie The Grapes of Wrath and inspired a Cars animated movie location. See the location of the now gone Gateway Arch (You Now Leave New Mexico) and visit the tiny village of Allentown with a Historic 1923 bridge. Elevation 6,188 ft (1,886 m). Population 25 (2010). Time zone: Mountain (MST): UTC minus 7 hours. Summer (DST) no DST⁄ PDT (UTC-7). Lupton is a tiny hamlet in Apache county, right next to the New Mexico State Line. See the Map of Lupton with its location on Route 66. This part of Arizona has been inhabited for at least ten thousand years. In more recent times, the Anasazi, or Ancestral Puebloans lived in this area. Their homeland covered the Colorado Plateau, a vast part of the south of Utah, Colorado, Western New Mexico, and Arizona west of the Colorado River and north of the Little Colorado and Puerco Rivers. The Anaszi were farmers and reached their peak between 700 and 1150 A.D., after which drought and invading nomads forced them to move south into New Mexico, becoming the Pueblo people met by the Spanish explorers after 1540. The groups that pushed the Anasazi to the southeast, were the Navajo people, hunter gatherers who learned some farming abilities from the Pueblo people. Later they adopted goat and sheep herding after the Spanish introduced them into their settlements. The Navajo or Diné ("People") were of Athabaskan origin, from Northwestern Canada and migrated to the American Southwest around 1400 A.D.
Francisco Vázques de Coronado was the first European in the area (1540), he conquered the village of Zuni Pueblo, and before marching towards the Rio Grande, sent a party commanded by Garcií López de Cárdenas to verify the rumors about the "Tizá" River, Spanish for "Firebrand", due to its intense red color. This tiny expedition marched across what is now Lupton, reached the Hopi village of Tuzan and discovered the Grand Canyon. The Spanish claimed Arizona, as a part of their American colonies, but never settled the region. They met and named the "Navajo" in 1620, north of Santa Fe NM. THe word derives from "Apachu de Nabajo" (Apache of Nabajo). From their territory in NW NM and NE Arizona, the Navajo raided the villages in Colonial New Mexico and continued doing sor during the Mexican period after 1821. Once the U.S. acquired the area (Arizona was a part of New Mexico at that time) after defeateing Mexico in the 1846-48 Mexican-American War, the American Army devised a plan to pacify the region. Fort Defiance was erected by Col. Edwin Sumner in 1851, in what is now Arizona, in the heart of Navajoland. It was attacked several times in the 1850s, and due to the onset of the American Civil War, was abandoned in 1861. Apache County has the most land designated as Indian reservation of any county in the United States (68.34% of its area). Neighboring Navajo County is in third place. The new Commander Brig. Gen. James Carleton engaged the Navajo from The "Old" Fort Wingate) near Grants (1862), rounded them up and marched them to an internment camp near Ft. Sumner. The terrible "Long Walk" of 450 miles (720 km) and the lack of water and food at Ft. Sumner led to a public uproar. Carlton was replaced, the Navajo Treaty was signed (1868) and the Indians were allowed the Indians to return to their homes in the new "Navajo Reservation". The spot where Lupton is now located was actually a crossroads in the 1800s. The "Shirts Trail" from Zuni Pueblo to Oak Springs crossed the Star Mail Stage Route, from Ft. Wingate, to Navajo Springs en route to Ft. Whipple. The nearest stops were at Cooks Ranch in NM (Nowadays it is Manuelito), and Emigrant Springs in AZ, south of what is now Sanders. Apache County was created in 1879 and in 1895 Navajo county was split from it western part. The Atlantic & Pacific Railroad which later became a part of the Atchison Topeka and Santa Fe RR (AT&SF) built its tracks westwards from Gallup in extended their tracks into the area in 1883 following the Rio Puerco of the West River. It was named after the 1905 Winslow train master G. W. Lupton, though another version is that G. W. Lupton owned the first trading post in the area. The surname Lupton is derived from a place in Cumbria, England originating in old Anglo-Saxon words "Hluppa" (a personal name) and "tun" (village). The small first post office opened in 1917 and shortly after, in 1926, Route 66 was aligned through Lupton following the National Old Trails Highway which had been created in the early 1910s. Lupton figuired in the (1927) Rand McNally Map, along U.S. 66, as being 12 miles east of Houck, Arizona on an unpaved but "graded road" which would be realigned in 1930. Route 66 was later replaced by I-40 in the 1960s. >> Book your Hotels in Chambers, Gallup (NM) or in Holbrook. >> There are RV campgrounds near Lupton, in Holbrook AZ and gallup NM. The climate in Lupton is dry and semi-arid climate with hot summers and cold winters. The altitude and low relative humidity provoke considerable day-to-night temperature swings throughout the year; this means that summer nights are cool, but winter nights can be quite cold. The average high temperature in summer (July) is 95°F (35°C). The average summer low is 59°F (15°C). The winter (Jan) has an average high of 50°F (10°C); with an average low of 21.9°F, below freezing (-6.1°C). Annual rainfall is scarce, with 9.5 inches (241 mm), and most of it falls during the Summer Monsoon period between July and October (5 in, 127 mm). There are only 50 days with precipitation every year. Snowfall is quite light with only 6.5 inches yearly, on average (16.5 cm). Most falls from October to April. There are no tornados in Lupton: Apache County has no Tornado watches. The area west of this point has no tornado events at all. Tornado Risk: read more about Tornado Risk along Route66. 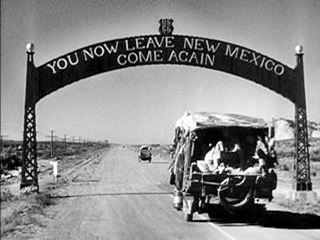 To the east is the New Mexico state line. Beyond it is Manuelito, Gallup (23 mi.) and further east, the city of Albuquerque (163 miles). To the west are Houck (11 mi. ), Chambers (26 mi. ), Holbrook (73mi.) and Winslow (106 miles). Check out Lupton on our Route 66 Map of Arizona, with the complete alignment and all the towns along it. Historic U.S. highway 66, "Route 66" has been designated as an All-American Road and National Scenic Byway in the state of Arizona. 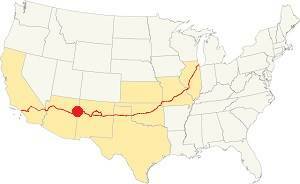 Click on the following link for a Full description of Route 66 across the state of Arizona. Lupton a very small village in Navajoland, on the historic Route 66, next to the New Mexico state line and at the foot of the Painted Cliffs, it inspired a location in the movie Cars and was filmed in the movie "The Grapes of Wrath". Lupton and novel and movie "The Grapes of Wrath"
This Pulitzer Prize winning novel written in 1939 by Nobel Prize author John Steinbeck (1902 -1968). See our page Grapes of Wrath for more details. The novel "The Grapes of Wrath" is set in the U.S during the mid-1930s. At that time, the Great Depression and the Dust Bowl drought had disrupted the American economy and millions were unemployed and defaulting their mortgages. Steinbeck portrays the fate of a family of sharecroppers, the Joads, who lose their land and home, pack their scant belongings and head west, to California seeking a new start. The novel was published on April 14, 1939 by Viking Press-James Lloyd. The book was filmed as a movie directed by John Ford with a screenplay by Nunnally Johnson. The cast included Henry Fonda, Jane Darwell and John Carradine. The Joads drive west towards California along Route 66, and the movie gives us irreplaceable glimpses of the Mother Road in 1940. One of the key scenes was shot in Lupton, the Arizona border cotrol post. "How long you plan to be in Arizona?" "No longer'n we can get across her." "I ought to look your stuff over." "I tell you we ain't got no plants." The guard put a little sticker on the winshield. "O.K. Go ahead, but you better keep movin'." Joad is clear, he is going to California, Arizona is of no interest, he may be poor and homeless, but he is still a proud man with a mission. The control post shows that the migrants were "a despised and economically impaired group,... scorned newcomers", yet "the tragic images of this migration have been overblown. The experience was often tough... but the challenge cannot be compared to the pioneer migrations of the nineteenth century, nor with the refugee migrations that occur with such frequency in the third world" (Gregory J.N., 1989). In fact, many of them returned to their abandoned homes, but others stayed and made good in California. 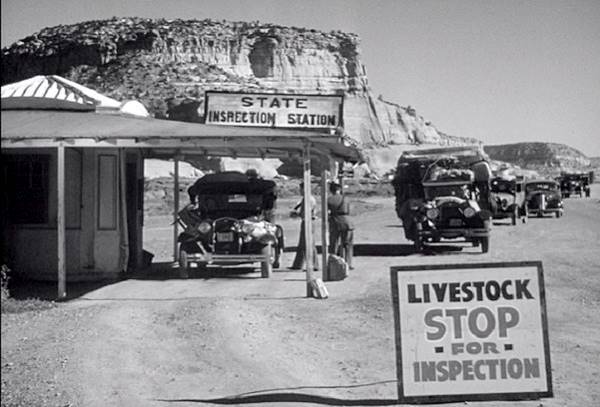 For the Route 66 historian, the images from John Ford's move are interesting, they were clearly shot in Lupton, the Painted Cliffs are the badckdrop to the "State Inspection Station" (see image below). The State Inspection Station with Painted Cliffs behind. From The Grapes of Wrath (1940). The US 66 Gateway Arch: "You Now Leave New Mexico"
The archway or "gateway" across Route 66 with the legend "You Now Leave New Mexico, Come Again" and the "US 66" shield crowning it, are very interesting. As you can see in the image below, the road in Arizona has a gravel surface. The paving ends under the sign. However an Arizona Department of Transportation's Road Map of Arizona from 1935 shows Route 66 as paved in Lupton. The scene was shot in 1940 and it is definitively Lupton, so perhaps the road was being resurfaced at that time. But where was the archway? Another still from the film, taken just before the Joads ride under the arch, shows a rock formation (see the photo below on the right side), this landform is located at Lupton. But further west from the border than the Painted Cliffs. 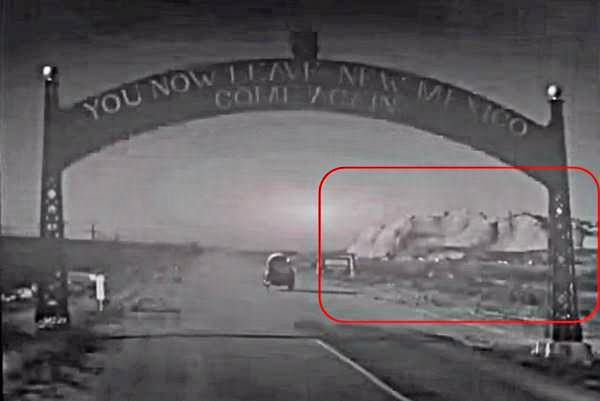 The Gateway ⁄ Archway over Route 66 and a view of the hills to the NW of it. The Gateway - Arch at NM AZ state line on Route 66. From: The Grapes of Wrath (1940). The view nowadays from where the gateway once stood. Click on image for a detailed Street View and the map. Notice that the pale sandstone cliffs in the center of the image are the same ones as seen in the movie still. The place where the gateway stood nowadays. For those interested in viewing the part of the film where the Joads enter Arizona, this Youtube Video shows it; the scene starts at minute 51 of the movie. (External link). The Navajo name for Lupton is inspired in this landform: Tsé Si'ání or "Setting Rock" and Tsedijooli or "Round Rock", both names refer to the Painted Cliffs. They are not towering (their height is 6,733 ft. - 2.054 m) which places them 545 ft (166 m) above the surrounding valley floor. To the south, beyond the Rio Puerco of the West River are high white and pink cliffs which have been eroded by rain and sand blown by the wind to form caves and pinnacles. Further west, the gray sandstone and purple shales form low mesas to the north and south of the road. But here, in Lupton are the red sandstones of Painted Cliff, they are also found along Helena Canyon. When the studio decided to make the animated film "Cars", it sent out scouts along Route 66 to identify iconic characters and unique features. They reached Lupton and spotted the Painted Cliffs. It inspired them and that was the origin of the "Wheel Well Motel" which was a ruin in that movie, but in "Cars 2" had been refurbished as a restaurant. 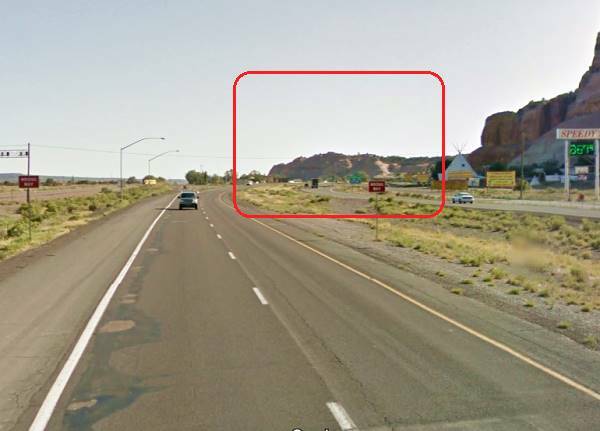 Compare the actual location with the still showing the "Wheel Well Motel" from the movie "Cars". The cave and the cliffs are strikingly similar. It also appeared in the sequel. It was a motel which closed when the freeway opened and later reopened. In Cars 2 it had become a restaurant. The Painted Cliffs are a classic sight at Lupton. Located on the north side of US Highway 66, they have been a landmark since the AT&SF laid its tracks through the area in the early 1880s. You can see them nowadays as you drive by along I-40, with their curves and ridges, steps and caves in the red sandstone mesa. 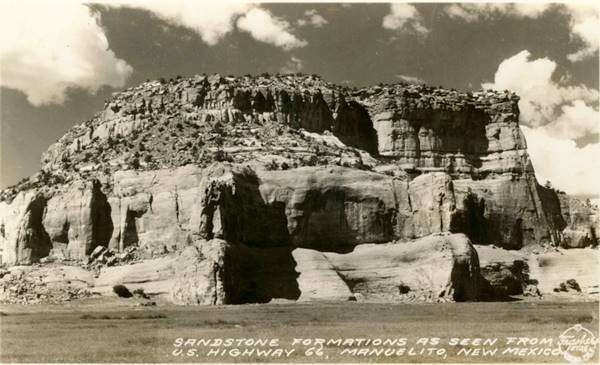 Below we reproduce a postcard of the Painted Cliffs, which states on its front side: "Sandstone formations as seen from U.S. Highway 66, Manuelito, New Mexico". And that is a mistake, the cliffs are not located in Manuelito, NM, but in Lupton Arizona. Painted Cliffs which are in Lupton AZ, mistakenly located in Manuelito NM. 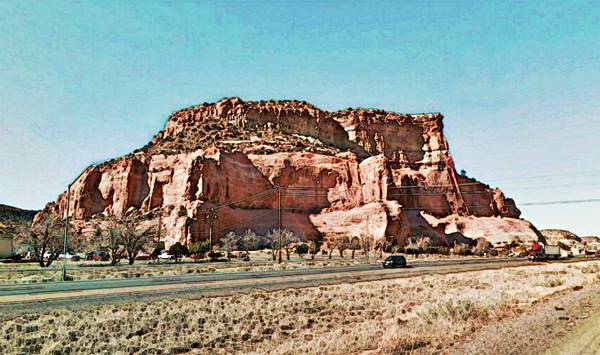 These iconic red sandstone cliffs on the north side of U.S. 66 appear in many postcards. This was also the spot chosen by the Trading Posts with a clear marketing point of view. Travellers heading towards the west would be more prone to buying souvenirs of the exciting "Wild West" than those heading east (who had already visited the region). State Line Trading Post Which was also a café and sold curios. Jack DeVeere Rittenhouse mentioned it in his Guide Book to Highway 66 (1946). Indian Trail Trading Post. It was built by Max Ortega in 1946 he operated it with his wife Amelia. It was demolished in 1965 and now an I-40 service roads runs across it. It was a real post as it sold goods to the local Navajos later he catered to the travellers selling jewelry. Their son, Armand Ortega reconditioned and owned the El Rancho hotel in gallup. Charlie and Mary's Place. Located next to the Indian Trail Trading Post. Now you can visit Fort Chief Yellowhorse with a yellow horse on its roof (don't miss the animal statues on the mesa above it) it has been operated by the Yellowhorse family, with Navajo roots since the 1950s, at one time they had a Shell gas station. At the foot of Painted Cliffs, it is the place to find out all you need to know about Arizona. Get maps, brochures, travel assistance, and also a Route 66 passport and have it stamped. Interstate 40, Exit # 359 - Grants Road, Lupton , Arizona. Open: 8 AM to 5 PM daily, closed state and legal holidays. Lupton, on the south Side of I-40, the 1926 alignment is less than 1 mile long. This Map of Route 66 in Lupton, shows the alignment. Further west it is buried under the roadbed of modern I-40 but reappears again, on the south side of I-40 as its South Frontage Road for only 1 mile before heading to the north side of the Interstate. This Map shows US66 just west of Lupton. You will have to reach the north alignment again, and follow it all the way into Allentown, this is the Map of Route 66 into Allentown. The map ends next to the now abandoned 1923 bridge just south of Allentown. Elevation 6,065 ft. (1.850 m). It was named after Allan Johnson, who was part of the Atlantic and Pacific Railroad staff in the construction Department. In the 1880s, the Johnson brothers settled there and raised cattle. The USGS map of 1923 and the AT& SF Railway map of 1915 both show it as "Allantown" not "Allentown", so the "A" must have become an "E" after the early 1920s. The station located to the west of Lupton was named Allentown. It was roughly half way between Lupton and Houck. Now there are some houses in this tiny village just north of I-40's Exit 351 (See Map with Allentown's location). Built in 1923 as part of the National Old Trails Road. Three years later it was included in the first alignment of Route 66 through this area. This original alignment ran south what is now I-40, and also, south of the Rio Puerco River, so it crossed it twice, one here, next to Allentown, and again further west, at Sanders. Built in 1923 on the Old Trails across the often flooding Puerco of the West River. It had a wood deck supplied locally to reduce the construction costs. The Allentown Bridge was a Pratt deck truss bridge. Truss is the steel structure formed of triangular units that give the bridge its strength. A "Deck" truss is one where the deck (roadbed) is placed on top of the truss. And a Pratt truss is shaped so that the diagonal beams face towards the center of the bridge. Read about the parks nearby, at Holbrook: Petrified Forest National Park. Will Croft Barnes, Arizona Place Names, University of Arizona Press, 1988. Jack DeVere Rittenhouse, (1946). A Guide Book to Highway 66.